CO2 laser is a carbon dioxide laser used for skin resurfacing through precisely removing outer layers of damaged skin to reveal the underlying softer, smoother younger looking skin. Skin Tags – are fairly small flaps of skin that protrude from the surrounding skin on the body. Skin tags vary widely in their colour and shape. Some are smooth, while others are irregular and bumpy. It can either be fleshed coloured or contain darker pigments. Treatment: Ultra Pulse CO2 laser can quickly and effectively remove all skin tags with minimal to no scarring on any part of the body – A far better alternative to Kryotherapy or cutting. Age spot removal through the use of Co2 laser. Ultra Pulse CO2 laser is the most effective treatment as it removes both the head and the root of the wart completely – never to grow again. 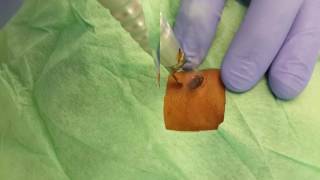 Due to the sensitive nature of the area anaesthetic is injected into the area which completely numbs the area so a quick and proper removal of the wart is accomplished. Skin Tags – are fairly small flaps of skin that protrude from the surrounding skin on the body. Skin tags vary widely in their colour and shape. Some are smooth, while others are irregular and bumpy. It can either be fleshed coloured or contain darker pigments. Treatment: Ultra Pulse CO2 laser can quickly and effectively remove all skin tags with minimal to no scarring on any part of the body – A far better alternative to cryotherapy or cutting. This condition is caused by a collection of yellowish cholesterol deposits underneath the skin around the eyes. Although they are not harmful, their appearance can be upsetting.Sufferers should ensure that they are tested for high cholesterol levels, though they can occur without this and often occur in families. The Ultra Pulse CO2 laser can effortlessly remove these deposits in one simple session( 15 min+/-). Quick and painless, no stitches required. The cost of CO2 Laser in your region ranges from US$0 - US$6,000 with the average being US$1,353. Costs vary from surgeon to surgeon and the complexity and area of the procedure. Let’s face it, deciding whether to proceed with CO2 Laser is no easy task. In fact, most find it an extremely daunting one. At Plastic Surgery review we believe reviews hold the key as past patient reviews help build a picture of what to expect when that day finally arrives. The fact that these reviews are actually past patient experiences goes a long way to help resolve a lot of the “questions” that constantly float in and out of our minds without having to actually ask the surgeon themselves. Whether you ultimately to decide to go through with a CO2 Laser or not, we always encourage interested parties to read as many CO2 Laser reviews as possible. Mixed research is extremely powerful tool when it comes time to decide on whether to go ahead with your CO2 Laser or not. These days we are blessed with an almost endless library of information, we know as the internet. Do your homework, research as much as possible, view multiple websites, compare reviews, prices and cost, across multiple surgeons and countries, view the surgeon’s actual CO2 Laser before and after pictures. Take your time, the key is not to rush your decision after 5 minutes of research and 3 positive reviews. Dig deeper, read both good and bad reviews, view multiple CO2 Laser before and after pictures and through this make an educated decision. Don’t rush, take your time it will make all the difference in the world.